rec. Ev Kirche Schallbach, Germany 20-23 October 2009. DDD. Johann Kuhnau (1660-1722) is best known as the cantor whom Bach succeeded at the Thomaskirche in Leipzig. He deserves more: in many ways his claim to be recognised as the greatest German composer of keyboard music before Bach is a good one, for example. Yet there are only a handful of CDs containing his music currently available; fewer concentrating on his vocal output; fewer still devoted exclusively to this melodious, inventive composer, whose music is shot through with devotion, concentration and singularity of purpose - and is graceful, elegant, dynamic and immediately appealing at the same time. A lawyer with expertise in various contemporary European languages and cultures (especially literature), Kuhnau is also credited with the development - effectively the 'invention' - of the keyboard sonata. 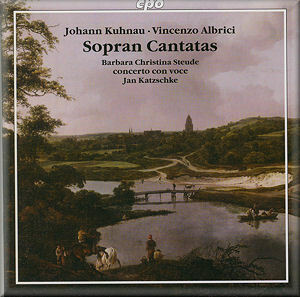 From the ever-enterprising CPO here is a CD featuring a selection of Kuhnau's sacred vocal music performed by German soprano Barbara Christina Steude, who was born in the Bach town of Mühlhausen; she specialises in the (German) Baroque and is an advocate for the undiscovered works of the period. The CD includes very satisfying performances of two complete cantatas, Weicht ihr Sorgen aus dem Herzen and Und ob die Feinde for the 15th and 23rd Sundays after Trinity respectively. Each is approached with undisguised vigour by Steude and Concerto con voce under Jan Katzschke. A collection like this inevitably stands or falls by the prowess of its sole singer. You can hear Steude's enthusiasm in her spontaneity and breathiness. Her controlled articulation of the musical lines and love of colour which are well matched by the lively, yet never wayward, playing of the between six and nine instrumentalists of Concerto con voce, whose only available CD to date this is. The ensemble was founded by Steude and Katzschke specifically to present music from the Renaissance to 21st century as it can be appreciated by an understanding of Bach. The same attachment to Kuhnau's own persuasively inventive textures and tunefulness is clear in their approach to the two single-movement pieces by Kuhnau included here: In te Domine speravi (also for the 23rd Sunday after Trinity) and the Bone Jesu for the 13th. At no time during their performance is there a sense that the musicians are going through a series of 'set pieces'. Nor trying to recreate a contemporary milieu. Rather, they present a winning, convincing and idiomatic account of the music. Ach Gott, wie läßt du mich verstarren was written when Kuhnau was under 30 years old. It's a kind of funeral aria for two of the officers at the composer's first appointment in Zittau. There are moments when Steude's voice verges on the emotional; wavers, almost (a minute into the final aria of Weicht ihr Sorgen, for example, and in the first and last thirds of Ach Gott). But this tends to add depth to her interpretation, not annoyance. Though if Kuhnau's chromaticism reminds you of Purcell's (and it should - especially in this funeral music), her slight vibrato would be out of place. Vincenzo Albrici (1631-1696) was a family friend and significant influence on Kuhnau. Two shortish movements from Albrici's Geistliches Konzert are also included on this CD. Each displays an extroversion and Italianate exuberance melodically which one would expect to contrast more starkly with the Protestant Kuhnau's style than they actually do. For the younger composer was sufficiently open to cosmopolitan sources (two of his own teachers had been pupils of Schütz, who twice visited Italy) to absorb whatever he wanted from all worlds. Omnia quae fecit Deus and Mihi autem bonum est receive the same dedication and expressivity that Steude and Concerto con voce afford the works by Kuhnau himself. They also demonstrate how much Kuhnau's works lack the darkness - which is not the same as seriousness - and even ponderousness of some of his contemporaries. Steude captures very well Kuhnau's restraint, his determination not to overreach gratuitously - without ever restricting the emotional compass needed. Lovers of the German Baroque will have no hesitation in buying this CD - and not merely for the historical importance of Johann Kuhnau. His music is very attractive in its own right. The youthfulness and excited singing of Steude may be just a little too theatrical for some tastes. But to see it as freshness and genuine forwardness instead is to warm to these qualities in a singer who fully understands the battle which Kuhnau waged against theatricality in church music and who appreciates the need to find the same quality of compromise as the composer did when prevailing trends seemed to lead in the opposite direction. The recording is good … close and immediate; very suitable for the music. The booklet contains full texts in German or Latin and English with some historical and biographical contexts of composer and performers. Not one to miss.